Pierre Westie: “It was a tough choice because all of this week’s stories are awesome. We decided to lead in with the most bizarre and we think you’ll agree it is definitely tops. 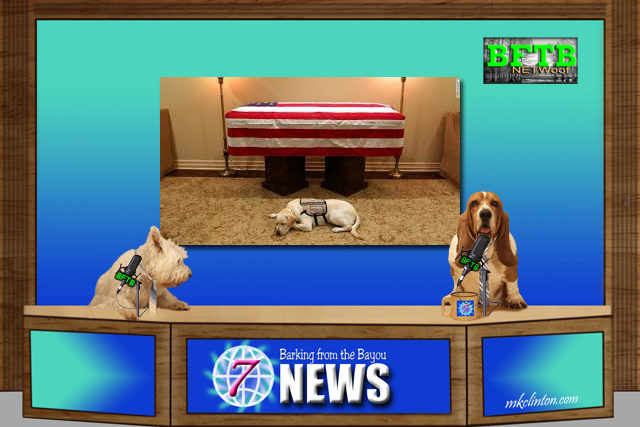 Bentley: “I’m sure y’all remember Sully, the amazing service dog of the late President George H. W. Bush. He became a viral sensation after a photo was taken of him in front of the president’s casket. Well, he has just received the A.K.C.’s 2019 Paw of Courage award for his loyalty, dedication, and distinguished service to the president. In February, Sully joined the Walter Reed Bethesda Facility Dog Program as a Navy Hospital Corpsman Second Class. His job now consists of interacting with patients to help reduce their stress. Way to be awesome, Sully! 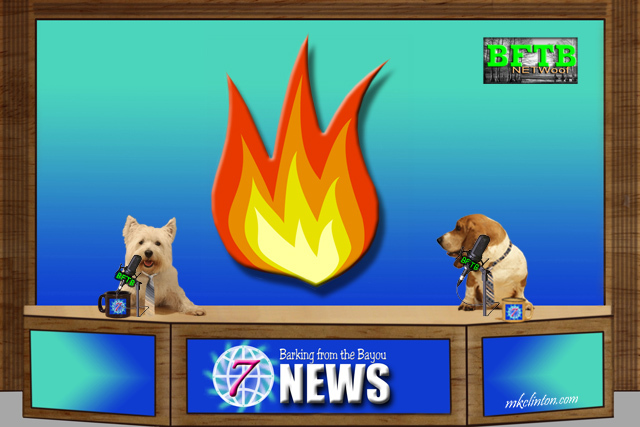 Paisley the Weather Lab: “Let me begin by saying I did not see that Snow Bomb coming for Colorado! Wow! That was an incredible winter event and I hope everyone was listening to their local stations for warnings and updates. I say that every week, but there are times like this where it is crucial to have the very latest in the weather for your specific area. It might not feel like it everywhere, but spring begins on Wednesday! There are record floods in the Midwest due to the rain and melting snow. My forecast calls for showers along the west but it shouldn’t be too bad. The northern states will welcome the new season with fair weather, partly cloudy skies and cool temperatures. The east coast will have some rain but several sunny warm days. Here along the Gulf coast, I’m expecting it to be nice with milder temps. Bentley: “We love our spring like temperatures here in Texas. This is one reporter that is ready for some serious sunbathing in the backyard. It is going to be a fun week here on the Bayou. Mom will be taking care of the grands today and tomorrow so she might be late visiting other blogs, but she will catch up. Her birthday is Wednesday (the first day of spring) and she is going to be really, really old. We hope you visit us that day because Pierre is joining me for my annual “Older than Methuselah” interview. 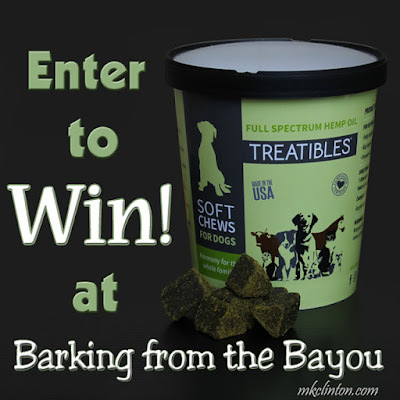 Don’t forget to enter for your chance to win Treatibles Soft Chews for your dog or cat. We use them for anxiety, itching, and to maintain Harmony for the Whole Family™. Entering is super easy. All you do is comment and then the form will open up giving you the option to visit/follow us on our social media and score some free points for visiting! This is a wonderful opportunity to discover what Full Spectrum Hemp Oil can do for your best friend. Thanks for visiting! Have a terrific day and be sure to grab yourself some happy. Visit our “Let’s TalkTreatibles” post to enter! 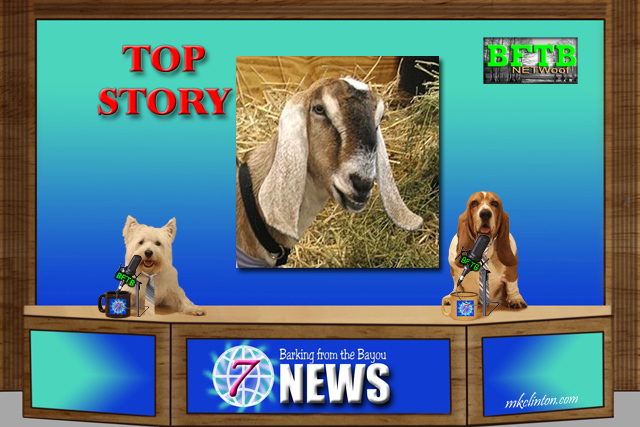 BOL, maybe we should have a goat president - it would be an improvement, BOL! Lincoln is smiling☺ Great stories - all of them! We saw some of the flooding over the weekend down in the Quadcities, homes underwater, roads and parks too. Glad some dogs are getting to run the half marathon with the blind person. It's easy for dogs to do and most of us love to run. Of course, you need the right breed to run distance. Have a fun week. We want a goat as our mayor! Lol! Aww - how cute! Great stories! Good stories! Goat for Mayor? Why not? We have a doggie mayor at Blogville! We are big fans of Sully who is such a good ambassador for service dogs. But a goat for mayor, now that is just silly. FYI: our current mayor is not running for reelection. Maybe we'll get some interesting candidates like the Goat. Paisley...no worries about missing the Colorado weather. you are still 99% more accurate than our local bunch. We have 3 local weather forecasts they never AGREE. Sully warms my heart and I heard/saw about the Service Dog and master running in the marathon. I finks the Goat will make an excellent Mayor! Thanks for sharing your news stories. We are very happy for Mayor Lincoln. The half marathon story is just amazing that they are all going to run 13.1 miles. Always great to read for whats going on. Have a wonderful rest of your week. Great stories. I really liked the one of Sully in front of the casket on his last job. I know it's a bittersweet story but now Sully is helping others. I hope I win your contest. How do I enter? Please enter me. Blogger isn't letting me enter or taking me t the contest. I want to enter. Please enter me. We sometimes think we animals would make MUCH better pawlititions than the peeps do! Having lived through the bomb cyclone in Colorado, I'm sure a lot more people would have stayed safer if they would have had power which wasn't fully restored until Friday. Loads of people were stranded on the major north/south corridor especially south of Denver. But the temps have been in the upp 40's since last week and the snow is melted except for north exposures which probably won't fully melt until late next month. The pet mayor is a good idea. I would definitely go into a fire for my pets. We just want Spring weather to arrive as soon as possible! We are so proud of Sully and yay for the dogs that helped with the marathon! 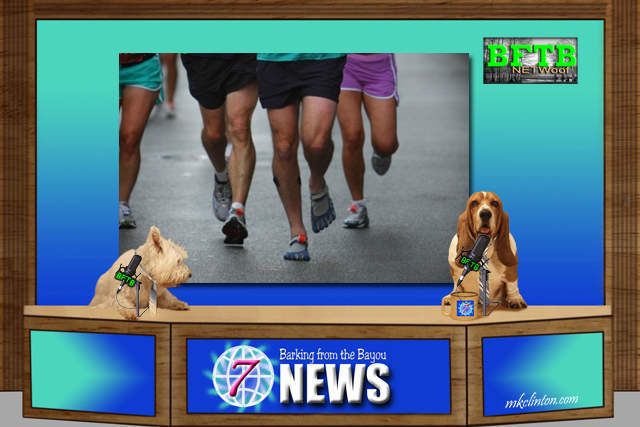 Oh, those doggies that are gonna help the runner are pawsome!!! I would do it too, butts I would be distracted by squirrels and weenies. Anyhu, FABulous report boyz and Paisley! I vote for more animals in politics!